One of the most surprising things about Carlsbad: all there is to see and do above ground. In March, daytime temperatures hover around 70 degrees in these parts, making Carlsbad a wonderful sunny weekend getaway. The small city of Carlsbad, which lies about 20 miles north of the Carlsbad Caverns National Park, also offers compelling attractions and restau- rants with outdoor dining, all of which afford plenty of opportunities to soak up the rays. Once you absorb your daily dose of vitamin D, descend 755 feet into the park’s famous 8.2-acre “Big Room” cavern and walk through its network of larger-than-life columns and caves. After you get back to the earth’s surface, explore the park’s 46,000 acres—which include backcountry trails through spectacular Chihuahuan Desert wilderness and a nine-mile scenic loop drive. Rates can be steep in Carlsbad, and hotels sometimes book up a few weeks in advance, thanks to high guest-room demand spurred by the oil boom in the region, which is on the edge of the highly productive Permian Basin. Expect rates averaging around $250 for the finer chain properties in town and well over $100 nightly for bare-bones motels. Carlsbad’s most distinctive—and romantic—lodging option, the redbrick Trinity Hotel, occupies a stately 1892 former bank building with tall arched windows and a prime location within walking distance of the downtown river-front. Guests check in through the ground-floor lobby, which contains one of the best gift-food-and-wine shops in town, then walk back outside to access the nine rooms, most of which are reached via a staircase to the second floor. These swanky accommodations have high-thread-count linens, leather sofas, wine-chilling machines, and travertine-tile bathrooms with glass walk-in showers. On the south side of downtown, the Hampton Inn & Suites Carlsbad is a top choice among the several chain hotels in town. Features of this four-story, 85-room property include an indoor pool room, and in-room microwaves and refrigerators. Additionally, La Quinta Inn & Suites Carlsbad, just four miles south of downtown and 16 miles north of the national park, opened in early December, and Marriott’s TownePlace Suites Carlsbad is planned to open in the heart of downtown this spring. On arriving in town, head to the lively and casual Red Chimney Pit Bar-B-Q for dinner. The restaurant occupies a rustic log-cabin building with a vaulted beam ceiling and tables set with red-checked tablecloths, fresh-cut yellow flowers, and walls decked with wagon wheels, mounted moose heads, and other Old West paraphernalia. Dig into a platter of spicy hot links, fall-off-the-bone slow-roasted turkey, or St. Louis–style spareribs. You’ll find a few interesting craft beers on the menu, too. 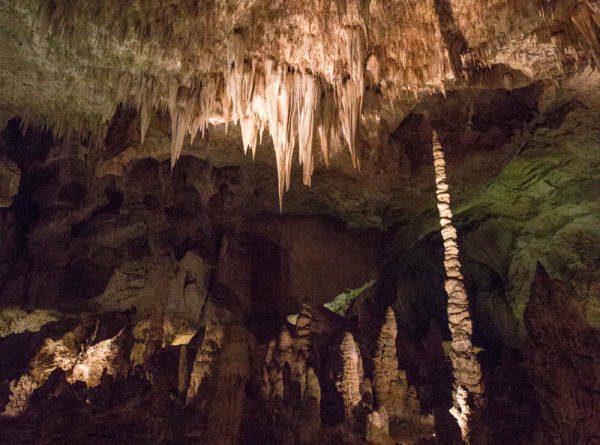 Two of the best things to do in Carlsbad are both closed on Sunday, which is why we recommend that you visit them on Saturday and save Carlsbad Caverns for Sunday. Mingle with locals over lattes, green-chile-and-sausage egg bowls, fluffy croissants, and other soul-warming breakfast fare at the cheerful Blue House Bakery and Cafe, which is aptly situated inside a blue bungalow on a quiet residential street on the north side of downtown. On warm mornings, take a seat on the spacious side patio. It’s a pleasant 15-minute walk through downtown to reach the free Carlsbad Museum and Art Center, which anchors a grassy square that’s also flanked by the public library. Spending an hour inside the city’s impressive—and actually quite underrated—cultural hub makes for an interesting prelude to visiting the caverns. The collection includes fascinating historical photographs of the early explorations of the caverns. You can also view an 1856 Wells Fargo stagecoach that once carried parcels along the Butterfield Overland Mail route through town, plus Navajo rugs and ancient Mogollon and Mesa Verde pottery, a vintage firearms collection, and an art gallery containing many permanent landscape watercolors by acclaimed early-20th-century painter and Carlsbad resident Roderick Fletcher Mead as well as such internationally renowned talents as Roswell-born Peter Hurd, French Expressionist Georges Roualt, and Taos painter LaVerne Nelson Black. Walk east about eight short city blocks to reach one feature of the community you might not expect in the Chihuahuan Desert: the beautifully landscaped 41⁄2-mile Pecos River Walk. You can rent a canoe or paddleboat at Lake Carlsbad Beach Park and stroll or jog along paved portions of a pedestrian promenade that flanks both sides of the river. Walk back through downtown, passing the stately Eddy County Courthouse, which was built in 1891 as an ornate Victorian but completely redesigned in 1939 in its current adobe Santa Fe style. Across the street, Yellow-Brix Restaurant occupies—you guessed it—a charming yellow-brick house with a large shaded outdoor seating area. “Brix” is also a winemaking term (a measure of sugar content), and the wine choices are correspondingly in the know. It’s a lovely spot for lunch, serving such eclectic fare as fried-catfish sandwiches, poached-pear salads, and chicken tortilla soup. Spend the rest of the afternoon touring the superb Living Desert Zoo and Gardens, which is set on a hilltop about four miles southwest of town and offers terrific views of the surroundings. After checking out the nature displays in the visitor center, walk outside to the beginning of the park trail, where you’ll encounter a wall bearing this quote from iconic conservationist John Muir: “In every walk with nature one receives far more than he seeks.” You’ll come to appreciate these sentiments as you stroll past the animals and plant life that thrive in the Chihuahuan Desert—expect to encounter everything from adorable burrowing owls and hog-nosed skunks to impressive pronghorn, elk, and black bears, plus an extensive collection of cacti, succulents, and desert shrubs. With its lofty pressed-tin ceiling, antique chandeliers, and sweeping curtains, the dining room inside the historic Trinity Hotel is the place in town for a memorable dinner. But first stop by the elegant bar to partake of a little wine tasting—you can sample Spirit of Seven Rivers wines from nearby Balzano Family Vineyard (the Tempranillo is a standout) as well as first-rate Italian varietals from Deming-based Luna Rossa Winery. All of these bottles are available for purchase in the extensive lobby shop, where you’ll also discover a variety of diverting gifts, from birdhouses clad in New Mexico license plates to locally made barbecue sauces and jams. In the restaurant, sample exceptional contemporary American and classic Italian fare, including the signature appetizer of local goat cheese topped with sweet-and-spicy blackberry-habanero sauce, and perfectly grilled chicken with a zesty lemon-caper piccata sauce. It’s not a bad idea to rise on the early side, enjoy a simple breakfast at your hotel, and gain a head start on the day so that you don’t feel too rushed during your exploration of Carlsbad Caverns National Park—there’s plenty to see here. A smart strategy is to begin at the visitor center, spending an hour or so checking out the well-conceived exhibits. It’s perched high on a 6,520-foot escarpment ridge that enjoys stunning panoramic views for miles around. You’ll learn about speleogenesis (the birth of the caves), see detailed models that explain the formation of stalagmites and stalactites, and view a fantastic diorama of the caverns, which gives a remarkable sense of just how extensive and deep they are. And you’ll learn about the park’s “most famous resident,” the Brazilian free-tailed bat—it’s the most prevalent of the 17 bat species in the caverns. About 400,000 of these insect- eating mammals swoop into the cave on spring and summer evenings, where they take shelter and raise their young. You can enter the Big Room cavern either by elevator or by walking down a steep 11⁄4-mile switchback trail that descends from just outside the visitor center. I recommend taking this well-maintained path into the cavern and then returning at the end of your visit by eleva- tor. However you reach the Big Room, once inside it you’ll follow a well-lit, one-mile paved walkway that meanders through this enormous cavern, revealing a fascinating wonderland of bizarre geological formations. A highlight is the fabled Hall of Giants, where the 62-foot-tall “Giant Dome” column rises above the floor—it’s the result of calcite in water that’s slowly dripped from the ceiling over the eons, and it’s surrounded by dozens of impressive stalagmites. You’ll also pass the old wire ladder that early spelunker Jim White built in 1924 to explore the caverns, the year after they became part of the national park system. Dining options are quite limited at the park—you might consider buying picnic supplies or takeout lunch in town and bringing it along with you. Additionally, there’s the cafeteria-style Carlsbad Caverns Trading Company restaurant in the visitor center as well as a snack bar in the Big Room, and just outside the park entrance you’ll find a handful of services in the tiny village of White’s City, including the Cactus Cafe, a rambling adobe building that serves burgers, steaks, Mexican fare, and more. Contributor Andrew Collins also wrote “25 Reasons to Love Silver City,”.